Friday was an absolutely gorgeous day. Despite nerves and panic seeding itself deep only a few days before, I was able to push it all aside and enjoy the day. I got some of my yard raked, and I got to break in my new bathing suit and get a little sun on my pasty white skin while enjoying the amazing book The Goldfinch. By Saturday morning, all of that calm was gone. Flew the coop. Then, by 9 a.m., insanity set in. I got my trainer band and headed backstage to the staging area, locker rooms and where hair, makeup, tans and the polygraphs were being done. Now, I’ve watched countless competitions via streaming on the computer or snippets here and there on television, and I follow dozens of competitors at all levels on social media. Nothing, and I mean nothing, can prepare you for what you step into when you go back stage. As a competitor or a trainer. At one point, I was sure that I was going to be consumed by tan fumes or hairspray. The staging area was full of chatter and minor chaos as competitors prepped, pumped up, and awaited the athletes meeting. Under it all, you could hear the hushed question over and over: Has anyone seen Mike yet? Mike would be the Mike O’Hearn. The first part of the competition series made a few mentions of his expected attendance at the event, and clearly it was highly anticipated by all. With some down time, we sat in the audience, watching the bodybuilding competitors do their thing on the stage. 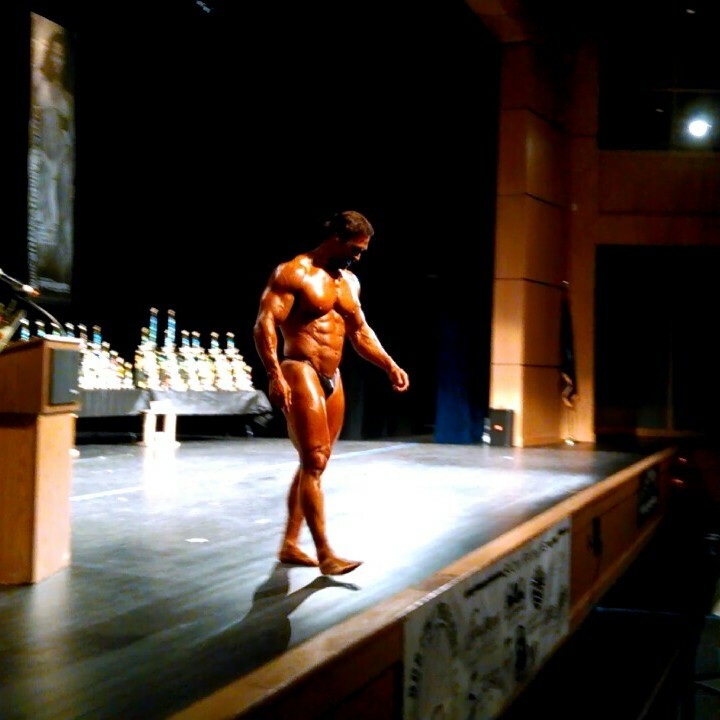 It was fascinating to see all of the different physiques flexing and working the stage. The most amazing was the Masters 50+ group. Men that truly were inspiring. I wanted to beat feet, hit the gym and pump some iron. When the figure competitors were finally called to line up, I was lucky enough to grab a spot barely five feet from the stage. Perfect for encouraging Aimee, helping her out if I saw her not quite doing her best, and making mental notes of things she needed to work on for her second stage (and what others were doing that seemed to catch the eyes of the judges). Making first call out had me jumping up and down, hooting and hollering, clapping insanely. My voice probably dominated all of the voices in the auditorium cheering on friends and family as well as other trainers rooting on their competitors. After a quick meet backstage after the first stage, Aimee hit the stage a second time, making first call out again. She didn’t think that she was going to place, but I had faith that she would. Her posing was strong, and her hard work was clear all over her body. The cut of her muscles looked stunning under the lighting on stage. The atmosphere was something else. It truly is one hell of an experience. I met a lot of incredible athletes backstage. The support and encouragement they all give one another was nothing short of awesome. It took me a bit to feel comfortable chatting with the others, but by the end of the night, I could roll on by a competitor and say “Lookin’ strong out there number 33!” and slap ’em a high-five. I heard some pretty great stories back there too. Ones that mirrored my own on this fitness journey, and ones that were an inspiration. One woman suffered a stroke two years before, but with work and dedication, was able to get herself back on stage. Looking at her, you would have never known that that was her journey. Watching her on the stage, you certainly would have never known. She was spectacular. Standing in the hallway during a little downtime, you could hear a quiet jingle-jangle. For all of those who follow my blog, you know of my experiences with my crazy dog Dunkin. Those experiences that often detail the sound of his jingly-jangly collar, and how it helps me locate him when he’s managed to break free and run wild. Hearing the jingle-jangle meant one thing: There was a dog in the building. Who would bring their dog to a competition (aside from someone needing a service dog of course)? None other than Mike O’Hearn. And then suddenly, boom, there he was. You never really realize just how big (or small) someone is until you see them in real life. I’m in the neighborhood of 5’4″-5’5″ depending on the day I’m having and when O’Hearn passed by Aimee and I with Stryker, I felt a smidgeon over 3-feet tall. The guy is huge. Sorry for the super creepy photo Mr. O’Hearn, but none of my fitness buds believed me that you were THAT close. I needed concrete proof. Wanting to catch some of the bikini competitors, we ducked into the auditorium and I took up a spot on the floor. Cheering on one of the girls I’d met in the locker room, I happened to look to my right and proceeded to immediately drop my phone (thankfully it’s in an Otter Box case). O’Hearn and Stryker were no more than 2-feet next to me. So naturally, I stared and sent out a few texts to friends (OMG Mike O’Hearn is RIGHT NEXT TO ME!). Of course none believed me, so because of my awkwardness in these kinds of situations, I took this creepy stalker-like photo (proof, because I haven’t figured out how to zoom my new phone’s camera, that he was pretty damn close). When it came time for t-walks, we were told that all competitors were to go out in numerical order. Which had Aimee and I both worried, she was to be the first figure competitor to hit the stage — directly behind the last male bodybuilder. Aimee is a very petite woman, and having her come out behind a huge bodybuilder was intimidating. But, like with everything, you’ve gotta take it in stride. Taking up my spot just in front of the stage, I watched the bodybuilders, awaiting Aimee’s t-walk. After the last bodybuilder ducked off stage, the event coordinator stepped on stage and started talking about O’Hearn. I covered my face with my hands and said out loud “No, no, don’t do this to Aimee! She can’t go on after him!” all while praying silently that he just graces the stage in his street clothes to maybe give a quick summarization of what his seminar was going to be about. Mike O’Hearn guest posing during the OCB Pine Tree State Bodybuilding, Figure & Bikini Competition, April 12 in Westbrook, Maine. Sorry O’Hearn, you’ve inspired me and your tips have helped me along the way, but my loyalties are strong. You’re a hard act to follow, and my poor friend was the one that had to walk out on stage behind you. I may or may not have contemplated sticking my tongue out at him. But instead, I got the entire thing on video. Aimee nailed her t-walk and the crowd loved her. She has a great, magnetic personality, so how could they not? Since she walked away with a fourth place trophy, I think I’m pretty spot on in that declaration. Before leaving, several of the competitors gave me encouraging words about doing my own competition someday. Or at least, I say someday, but they all gave me a much shorter timeline. Some said a year, some said this summer. While it most certainly was an experience of a lifetime, and one that I’m happy as hell that I got to experience, I still don’t know.